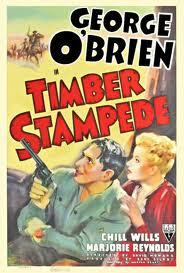 TIMBER STAMPEDE is another fun George O'Brien "B" Western from RKO. He's aided by a nice supporting cast and some good-looking location shooting. Rancher Scott Baylor (O'Brien) and his friend Whopper (Chill Wills) uncover a scheme by some greedy businessmen to illegally file homestead claims and buy up timberland. 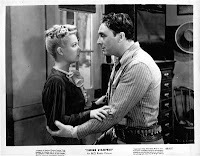 There's a whole lot of fighting and a number of shootouts, but justice is done, a hired gun goes down to defeat, and Scott also lands a lovely newspaper reporter (Marjorie Reynolds). The end! This is one of four films in which Wills plays Whopper, who loves to tell tall tales. Wills, who was in his late '30s at the time, makes a good sidekick in these films. He contributes some nice amusing moments but doesn't cross the line into being annoying as some of the comic "B" Western sidekicks tend to do. 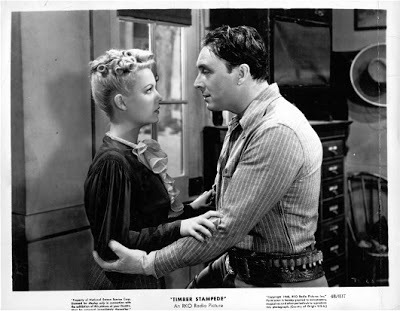 By 1939 Marjorie Reynolds was a veteran of over two dozen movies, many of them Westerns; she had previously costarred with O'Brien and Wills in RACKETEERS OF THE RANGE (1939). Her many roles in 1939 even included a tiny role as a guest at the Twelve Oaks barbecue in GONE WITH THE WIND (1939). Her best-known work includes the Christmas perennial HOLIDAY INN (1942) and Fritz Lang's great mystery MINISTRY OF FEAR (1944). In the '50s she starred with William Bendix in the TV series THE LIFE OF RILEY. She passed on in 1997. The supporting cast of TIMBER STAMPEDE includes Morgan Wallace, Robert Fiske, Earl Dwire, Billy Benedict, and Bob Burns. Hank Worden, who pops up in so many of these movies, has a key scene as a photographer. The movie locations shot in Sonora, California, give the film a fresh look, as the timber country and the shady streets of the town of Wagon Wheel don't look familiar -- always a nice plus in a "B" Western. The movie was filmed by Harry Wild and directed by David Howard. It runs 59 minutes. 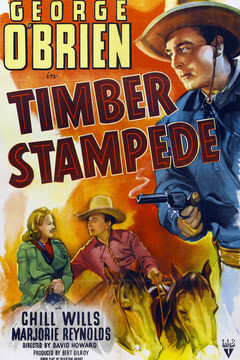 TIMBER STAMPEDE has been shown on Turner Classic Movies. Previous reviews of George O'Brien "B" Westerns: THE RENEGADE RANGER (1938), GUN LAW (1938), PAINTED DESERT (1938), BORDER G-MAN (1938), ARIZONA LEGION (1939), THE FIGHTING GRINGO (1939), THE MARSHAL OF MESA CITY (1939), and LEGION OF THE LAWLESS (1940). February 2016 Update: TIMBER STAMPEDE is now available on DVD from the Warner Archive in the nine-film George O'Brien Western Collection. I have reviewed the TIMBER STAMPEDE DVD here.